While we were camping in the Outback, Sydney was under siege of dust storms from the Red Center. We got there just as the last of them was blowin g in, and then the skies cleared and the sun made Sydney Harbour sparkle. Where we come from, big city downtown harbor water looks pretty mucky and dark, but in Sydney it was a gorgeous blue that was clear and inviting. The edge of the lovely Botanical Gardens becomes a walkway along the coastline up to the landmark Opera House and then on to Circular Quay. Patrick was initially not impressed by the Opera House's appearance--it seemed to be rather discolored and dingy. It wasn't until later in the day that he connected the dots and realized that it simply hadn't been cleaned off from those pesky dust storms. 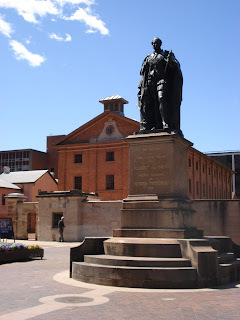 There are a collection of neatly bunched together historic buildings to see in downtown Sydney ri ght off of Hyde Park including the old British Empire mint, convict barracks, hospital, and the state's Parliament which offers free tours of the chambers. Another nearby freebie in the Botanical Gardens is the New South Wales Art Museum where we took a visit to peep some Australian art. While the more modern stuff was enjoyable we found that Australian art of the 18th to early 20th century was pretty much the same as English and American art of the time...lots of interesting landscapes and portraits, and by interesting we mean not interesting at all. Sorry Thomas Gainsborough. While in Sydney proper we also found a little time to catch the Aussie Footy Grand Final between our St. Kilda Saints and the favored powerhouse, the Geelong Cats. Geelong had won two years ago and the Saints hadn't won in 43, so we really cheered our hearts out at a local pub (aided by a few jugs of Toohey's New) for the underdogs, but they fell tantalizing short in a very entertaining game. But our favorite sites were definitely the beaches. 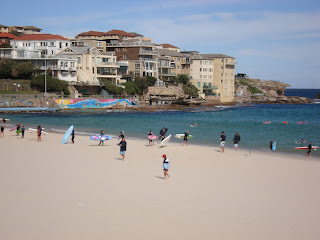 Bondi is perhaps the most famous and it is the closest at just a ten-minute train ride away. It's not huge, but it's definitely much more scenic than you might expect from a city be ach. On one end we saw a huge teenage surf class running drills in the chilly spring ocean. We didn't spend too much time there however as we were being pelted in all directions by wind-propelled grains of sand. Katrina descrined it as "a wind that was trying to rip you apart at the seams". Further up the coast Manly Beach was much more expansive, with a scenic walkway that hugs miles of coastline in and out of Sydney Harbour National Park. It had a cute town center, too, with the main street Corso lined with fish and chip shops. The best part about Manly is how to get there: we took a ferry directly from Circular Quay to the beach. It was very convenient, great fun, and cost a fraction of what the harbor cruiselines charge for a tour. We can pick out the Opera House and Harbour Bridge on our own thank you very much. For accommodations in Sydney we returned to our trusty old friend from Brazil, the Hotel Formule 1. And our room was practically a twin of the Sao Paulo one. It is located right at the edge of King's Cross--outside the seedy parts--and we got the benefit of being surrounded by lots of inexpensive eateries, a supermarket, and a big train station. What really stood out, though, was Spigolo restaurant three blocks away. We had one of our most memorable dinners there: an all-you-can-eat, made to order pasta and pizza bonanza with accompanying glass of delicious Australian wine. And we aren't talking Olive Garden endless bowl of pasta food quality here...the food was unbelievably good. They offer this feast every non-weekend night for about $20 USD per person; if we lived in Sydney, we would be there at least once a week. View more pictures from Sydney here. I think you really had fun in Sydney after reading your blog. There are other adventure places to visit in Sydney, like cruising, blue mountain tour, hunter valley coach tour, etc. Pictures are really good as well . Sydney is one of favourite places in the world -as is all of Australia. Been there twice so far. Enjoy every minute of your travels. Awesome stuff! which is about the Aussies fighting in WWI. Anyway, in the song the troop ship left and returned to Circular Quay. 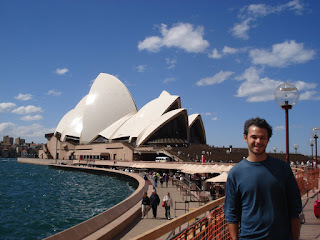 Syndey was one of my favorite cities in Australia. Beautiful weather and I felt safe, 'considering I was traveling alone'. I have fond memories including, Skydiving! You have an extensive travel list. How fun. It's easier to travel when you don't have children, although not impossible.